Modern apartment with large terrace close to the beach in Pointe Croisette. You will find this lovely apartment on the 4th floor of a contemporary building in the Pointe Croisette district of Cannes (also called Palm Beach), with a large terrace where you can enjoy your breakfast or a dinner with friends and family. 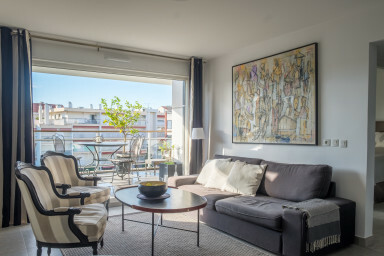 The apartment is very light and airy, with large sliding windows that take you from the living room out to the terrace. All in all, this gives a very open feel and provide lots of natural sunlight throughout the apartment. You can be sure that the terrace and sofa inside the glass doors will become your favorite spot in the apartment! There are two bedrooms, both with two single beds that can be arranged as double beds. One of bedrooms have its own private bathroom and there is also a bathroom and a separate WC in the corridor. All of the furnishings and fittings are of a very high standard. There is also a modern and fully equipped kitchen with all the expected equipment, appliances, crockery and cutlery. All the shutters are electric, and the rooms are all air conditioned. The apartment is located in the Pointe Croisette, also known as Palm Beach in a calm street close to the beach. Palm Beach has its own little community at the end of the Croisette with shops, restaurants and with beaches on 3 sides of the headland. Public beach only a short walk from apartment with sailing and water sports club. This is a top location for those of you that still want to be close to the action but require peace and quiet. You will have everything within easy walking distance, the beach, shops, restaurants, the Casinos, top night clubs like Le Baôli, a beautiful harbour full of some of the world’s most exclusive yachts. The city centre and the Palais des Festivals is only a 25 minutes walk along the Croisette. 15min walk to Hotel Martinez. The open-topped bus (bus no.8 3min.walk) is perfect to travel along the Croisette, between Palm Beach, the Palais des Festivals and the other end of the Cannes bay. More like a sightseeing tour then an ordinary bus trip.